Car or trade shows have always excited me! When you become proficient at giving compelling product presentations, you will notice an immediate positive response from total strangers who are fascinated by what you say. The potential to develop new clients as a result of these contacts is a challenge to see how many can be turned into an actual sale. How does Alex becomes a friend to the entire family including children? How does he capture their interest regardless of their station in life? How does he follows up effectively on almost everyone he meets at the car show. Why do so many ask Alex for his business card before leaving the display? How do you stand out in such a relatively harsh cold arena filled with so many non-emotional sales representatives and vehicles? Alex was at the Fort Worth car show in 2006 for six hours. 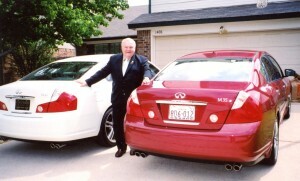 Alex sold six people a new Infiniti who personally asked for him within six months and they gave him three new referrals – all as a result of meeting at that car show! Car shows require a huge investment from participating local dealers. Most sales people hate the word “car shows” because they have relied on their mere presence at their product display area to turn into sales. They will not. 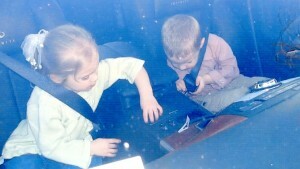 Twin grandchildren Kelsey and Ethan fasten seat belts in Alex’s demonstrator Infiniti May 2007 after their birthday party! I see it differently! Everyone is a buyer or knows of someone who will be a buyer. I place myself at our most prestigious model. What does Alex do next? How does he capture their attention? It’s important to understand that most people have been sitting in a vehicle with some age so the seats and interior appointments are no match for the touch, smell and feel of a new vehicle. It’s going to leave them with a pleasant feeling.